In 1994, along with her sister Olga, and a very close friend, Stella went on a bus tour to Alaska and cruise along the coast down to Prince Rupert and back on the bus to head home - a very memorable time. Stella spends two or three months of the summer at the cabin at Ditch Lake. There, many happy re-unions have been held. 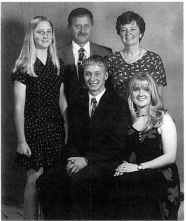 At the last Paulsen reunion in 1995, we celebrated the 100th wedding anniversary of our parents. Cynthia Marie, boru June 30, 1978, graduated from Erickson Collegiate in 1996. Cindy recently completed her Bachelor of Science degree at Brandon University majoring in Mathematics. Cindy continues to enjoy partic­ ipating in sports such as hockey and soccer. Dean Michael, boru May 4, 19S0, graduated from Eirckson Collegiate in 1995. He played hockey all the years he attended school as well as baseball, soccer, etc. He is presently in second year apprenticeship as an elec­ trician with Jamieson-Judd in Brandon. Laura Anne, boru March 21,19S5, is currently attend­ ing Erickson Collegiate in Grade 9. She enjoys softball, waterskiing and school sports. James Frederick, the middle child of Art and Stella, was boru April 2S, 1951. Early years were full of excite­ ment, growing up with an older brother and a kid sister, and many cousins living close by. A weekend hardly ever went by that some of the cousins weren't together - doing all the things country kids did in those days. Jim attended Otter Lake School until it closed In 1962, and then Erickson. Jim wasn't overly interested In school except for the sports - especially playing soccer with Gene and Mervin. After high school Jim stayed home to help with farming and that is where he remains - there is always work to be done and Jim still finds enjoyment in the farm life. Jim was really happy when his dad was finally convinced to quit milking cows and go into beef cattle. In March of 1974, Jim married Janet Hanson of Brandon. James Ryan was boru March 5, 1976. Tracy Lynn was boru December 29, 1977. Jan and Jim separated in 19S5 when Jan moved to Oakbank, where she currently resides. 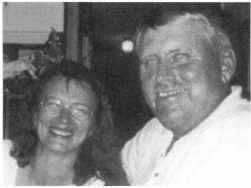 On February I, 1992, Jim married Benita Grace Benedictson (born August 13, 1955 at Eriksdale, MB to Nettie Jane (Kelleway) and Fridjon Benedict Benedictson). They live in a mobile home on the home quarter SW 15- IS-IS. helping Jim on the farm.